At Braemar Gathering last year I picked up some information on this new charity as I had seen a likely looking candidate stalking about my home. 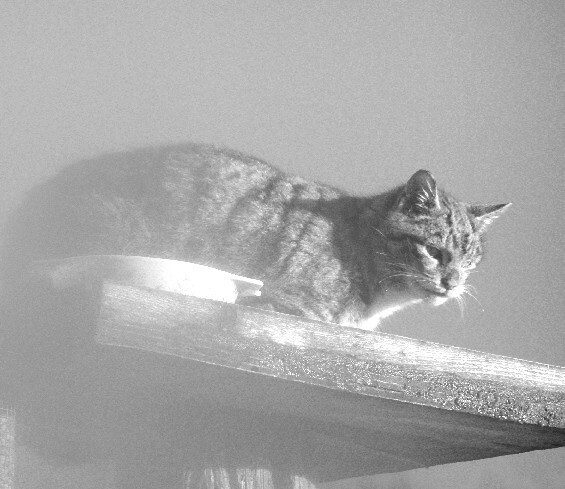 Then, as if by serendipity, he I she appeared on my bird table (the bandit) and! was able to get a couple ofsnaps. I sent them in to the charity and sure enough, got the positive response back that I may in fact have a moggie with a pretty good wildcat pedigree living, presumably wild, locally. Remembering that the Scottish Wildcat is a our logo, and that in the early days, carried the motto of "Tak tent" meaning take notice of what is going on, rather than go camping, here is an article supplied for us by them. The Scottish Wildcat Association was formally recognised as a charity just a year ago after spending much of 2007-2008 pushing the wildcat into the national spotlight through a range of public awareness projects including their popular website, social networks like Myspace and Facebook, and constant publicising to press and media from national papers to web blogs and cat breeder's magazines. Charity status has helped expand their efforts into more direct conservation actions. 2009 saw the launch of the "World Leading Breeding" campaign that generates publicity and sponsorship for wildlife parks directly involved in the captive breeding program. Helping small parks expand, improve and rebuild enclosures and big parks come up with ambitious new concepts in very large open top enclosures off exhibit to the public giving the wildcats the absolute privacy they prefer, the aim is to help create welfare standards for captive cats above and beyond that given to any other small feline species in the world. 2010 sees an even bolder project unfolding in association with a huge number of welfare and conservation organisations and some of the world's leading conservation researchers and scientists from the UK and USA. The Wildcat Haven project seeks to neuter tens of thousands of feral cats (one of the wildcats key threats through cross species breeding and hybridisation), ultimately removing them, and the terminal feline diseases they often carry, entirely from 7,000 square miles of the West Highlands over the next decade. Welfare volunteers will work side by side with leading field researchers surveying the wildcat population in detail to better understand how they can be protected and how human persecution like shooting and roadkills can be reduced. One of the largest scale conservation projects conceived in the UK for our last native cat and most critically endangered mammal, it is drawing praise from the likes of Dr Jim Sanderson (of the Small Cat Conservation Alliance and IUCN Cat Specialist Group) who has called it the only viable plan to save our wildcat from extinction. Wildcat Haven launches with a short field trial in Ardnamurchan from summer and rolls out its full program next year, with volunteers very welcome especially those offering experience such as wildlife surveying or mountain leading; learn more by keeping an eye on their website at www.scottishwildcats.co.uk and the new website being developed around the project www.wildcathaven.co.uk.